Two black-shawled widows step from the title into Wilson’s poem, taking readers into lines paved with sound: a scene enlivened by congested tenements and the rhythm s of the multisyllabic clamorous, tenement, sycamore, alameda, and by rhythms that strike the ear like the hard click of a woman’s heel. Wilson’s sonic and visual imagery draws readers deeper into the poem, and foreshadows the poem’s later vision of the cathedral rising from its foundation, through references to birds: the hungry pigeons and the “stork-priested cathedral,” the black-and-white stork figuratively suggesting the black cassock and clerical collar of the priest and, symbolically, the “mother-love” of the priest for his church. The two widows wrapped in the shawls of grief, bent with questions, feed the emblems of home, security, peace and gentleness, while spurning with their spit (once the spill of tears) Franco and the honors given to fascism. The two women are dark seasons of belief: seasons and thus natural, changing, and yet constant. But the poet adds the modifier “dark” and so lightless and so meaning winter? Mysterious? Tragic? Troubled? Two widows who have held to their beliefs during troubled times. But what do they believe, the widows whose belief the poet will soon compare to the votive candles in the church? As their whispered prayers pull the cathedral, a “prismed balloon,” from its moorings,” their votive offerings bear more power than the “husk” of a “stork-priested cathedral” or the facsimile of a fascist dictator. 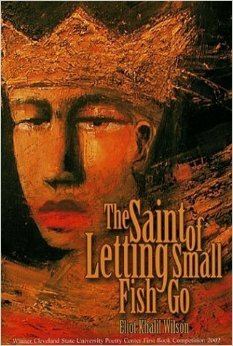 “The Black-Shawled Widows of Castilla y León,” from Eliot Khalil Wilson, The Saint of Letting Small Fish Go. Cleveland State University Poetry Center, 2003. This entry was posted in A Space for Image on January 12, 2017 by admin.